Prosthodontics is the dental specialty that treats patients with missing or deficient teeth and/or oral and maxillofacial tissues. Optimal oral health and esthetics are obtained for patients through the use of dental implants, dentures, veneers, crowns and teeth whitening. Through diagnosis, treatment planning, rehabilitation and maintenance, a prosthodontist can improve the oral function, comfort, appearance and health of a patient. If you are in search of a dentist for denture treatments in Dubai, visit us at Bright Smile Dental and Orthodontic Center and one of our best prosthodontist will engage with our patients ensuring their experience with us will be a pleasant and safe clinic for their dental care treatments. 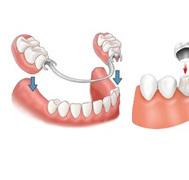 A denture is a removable replacement for missing teeth and surrounding tissues. Two types of false teeth are available -- complete and partial dentures.